We have been waiting for a change in blogger as it not only a gift for bloggers but also it gives us a confirmation that Google is not going to kill blogger soon. As google has mercilessly killed many of their services so many of the blogger think that Google may kill Blogger soon. This time Google gifted us a very good security for our blogs HTTPS encryption which has many benefits from HTTP. Here is the benefit of Securing Blogger Blog with HTTPS. HTTPS is a cornerstone of internet security as it provides several important benefits: it makes it harder for bad actors to steal information or track the activities of blog authors and visitors, it helps check that visitors open the correct website and aren’t being redirected to a malicious location, and it helps detect if a bad actor tries to change any data sent from Blogger to a blog visitor. HTTPS add trust of readers to your blog in case of security. So you must add this feature. 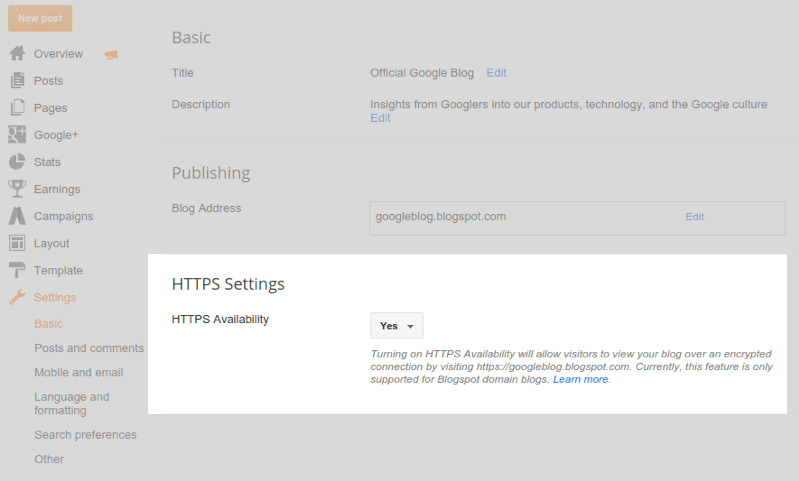 now here are the steps which you need to follow in order to add HTTPS support to your blogger blog. Follow the below steps to get it for your blog. Note: You will not be able to enjoy this service on your custom domain. Firstly, Sign in to your Blogger by using your gmail inputs and select your blog.Now Click on Settings from sidebar and go to Basic (by default you go to the Basic first so no need to click anywhere else). Look for HTTPS Settings, and click on down arrow and select YES. Automatically changes will be saved. and Congratulations, you have safely add HTTPS support to your blogger blog for free. Enjoy Blogging.